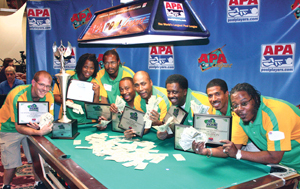 The winning team in the 8-Ball Open surprises its coach and tops record field at the APA National Team Championships. A year's worth of work on safeties and strokes paid off for Westside of Kankakee, Ill. The 8-Ball Open final of the American Poolplayers Association's National Team Championships felt like a heavyweight title fight. An emcee introduced the teams with a dramatic flair. Rock music blared from the PA system. The stands, which were full, buzzed with anticipation. But in the end, two flyweights decided this championship. In the third match of the final, Robert Mingo - an APA skill level 3 player - defeated Glenda Sell, an APA 2, to give Westside of Kankakee, Ill., a title-clinching victory over Secretly Sloshed of Shreveport, La. Mingo, a child-care worker and grandfather who plays pool twice a week, won the match, 3-0. "God is good," said Mingo, after the match. "That's all I can say - and also that I was lucky. It's a really good feeling, though. It's wonderful." Needing to win three games before Sell won two (the APA's Equalizer handicapping system allows players with lesser skill levels to win fewer games), Mingo quickly took control of the match. He won the first two games by sinking balls early, playing cautiously and holding off Sell. After another charge by Sell in the third game, he tapped the 8 ball into the corner pocket and looked skyward. It was an easy shot - but made more difficult with 200-plus people watching, including his teammates, and $25,000 at stake. "I just reflected back on everything," said Mingo of his thoughts as he lined up the last shot. "I played terrible coming into the tournament and terrible at the start. I was just trying to make up for it, trying to help my team out in any way possible." Sell, a retired security guard and grandmother who's played pool for six years, had her chances. She scratched on the 8 ball in the first game and missed three shots on the 8 in the second game. "I just wish I could've made the 8 ball," said Sell, "but I tried my best, and that's all my teammates ever ask of me." It was a drama that played out hundreds of times over the course of this year's APA National Team Championships, held Aug. 15-23 at the Riviera Hotel & Casino in Las Vegas. More than $1 million in prize money was for grabs for thousands of players in several events, including open 8-ball and 9-ball team events, 8-ball and 9-ball doubles, and the APA Wheelchair Challenge, won by 2006 champ Charlie Hans. The main event is the Open 8-Ball. Westside coach Reggie Runnels didn't have high expectations at the start, making the 3-0 victory over Secretly Sloshed even sweeter. "I'm so happy, man," he said. "It's my first time ever winning something like this in pool. I put this team together and we worked hard all year on defense and our strokes to get here and win this. I just feel really good right now. I don't know what to say." Despite the final outcome, Secretly Sloshed's captain, Randy Mason, was similarly proud of his team. "It's always deflating when you lose a championship," said Mason, "but we lost to a very talented team and probably the better team. In a lot of ways, we overachieved. We're tickled pink to have been here and, in some ways, we're happy the experience is behind us, because it was a grueling road to get here."